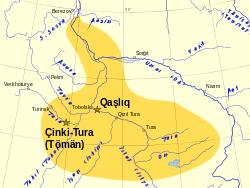 The Khanate of Sibir, also historically called the Khanate of Turan, was a Turkic Khanate located in southwestern Siberia with a Turco-Mongol ruling class. Throughout its history, members of the Shaybanid and Taibugid dynasties often contested the rulership over the Khanate between each other; both of these competing tribes were direct patrilineal descendants of Genghis Khan through his eldest son Jochi and Jochi's fifth son Shayban (Shiban). The area of the Khanate was itself once an integral part of the Mongol Empire, and later came under the control of the White Horde and of the Golden Horde. The Khanate of Sibir ruled an ethnically diverse population of Turkic Siberian Tatars, Bashkirs and various Uralic peoples including the Khanty, Mansi and Selkup. The Sibir Khanate was the northernmost Muslim state in recorded history. Its defeat by Yermak Timofeyevich in 1582 marked the beginning of the Russian conquest of Siberia. The Sibir Khanate was administered by Mirzas who originated from various indigenous Siberian tribes. These Mirzas organized loosely knit dominions, which were all under the nominal authority of the Khan of Tyumen and Sibir. Mirzas also led the warriors of the Khanate of Sibir into battle and owed nominal allegiance to the Khan of Tyumen and Sibir. Islam was the professed religion of the Sibir Khanate; it was the religion of the ruling Khan of Tyumen and Sibir. Grand mosques, palaces and fortified walls were constructed[by whom?] in both Tyumen and Sibir. The leading Imams and Muftis of the Sibir Khanate are known[by whom?] to have had some influence in the nearby regions of Kazan and even in Samarqand. The Khanate of Sibir was the northernmost Muslim state in recorded history; its territories even included parts of the shore of the Arctic Ocean. The Khanate of Sibir was founded in the fifteenth century, at a time when the Mongols of the house of Jochi were generally in a state of decline. The original capital of the Khans was Chimgi-Tura. The first Khan was Taibuga, who was a member of the Borjigin. He was succeeded by his son Khoja or Hoca, who was in turn succeeded by his son Mar. The Taibugids' control of the region between the Tobol and middle Irtysh was not uncontested. The Shaybanids, descendants of Jochi, frequently claimed the area as their own. Ibak Khan, a member of a junior branch of the Shaybanid house, killed Mar and seized Chimgi-Tura. A Taibugid restoration occurred when Mar's grandson Muhammad fled to the eastern territories around the Irtysh and killed Ibak in battle in c. 1493. Muhammad decided not to remain at Chimgi-Tura, but chose a new capital named Iskar (or Sibir) located on the Irtysh. 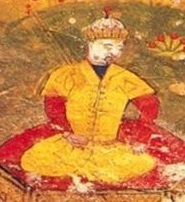 The Russian conquest of Kazan in 1552 prompted the Taibugid Khan of Sibir, Yadigar, to seek friendly relations with Moscow. Yadigar, however, was challenged by a Shaybanid, Ibak's grandson Kuchum. Several years of fighting (1556–1563) ended with Yadigar's death and Kuchum becoming Khan. Kuchum attempted to convert the Siberian Tatars, who were mostly shamanists, to Islam. His decision to conduct a raid on the Stroganov trading posts resulted in an expedition led by the Cossack Yermak against the Khanate of Sibir. Kuchum's forces were defeated by Yermak at the Battle of Chuvash Cape in 1582 and the Cossacks entered Iskar later that year. Kuchum reorganized his forces, killed Yermak in battle in 1584, and reasserted his authority over Sibir. Over the next fourteen years, however, the Russians slowly conquered the Khanate. In 1598 Kuchum was defeated on the banks of the Ob and was forced to flee to the territories of the Nogai, bringing an end to his rule. The Khanate of Sibir and the town of Tyumen were founded by Taibuga probably some time between 1405 and 1428. The latter was probably of Keraite origin. However, some scholars also attempt to link the Taibugids to the Kipchak elites and others. Control alternated between the descendents of Taibuga and the Shaybanids who had descended from Genghis Khan. There are hints that the Shaybanids were more connected to the steppe nomads and that the Taibugids were more connected with the forest peoples to the north and east. Taibuga's father was called On (On-Son, Onsom and other variants). Grousset says that they were 'the issue of Taibugha-bäki' without explanation ('bäki' (bek) was a princely suffix and Taibuqa was a Naiman chief at the time of Genghis Khan.) A few sources identify him with Bek Ondi Oglan, the great-great-great grandson of Shayban, and thus a Shaybanid. The Stroganov chronicle says that On was killed by a chief called Chingi who spared Taibuga, sent him to fight the Ostyaks and granted him his own principality. Taibuga founded Tyumen and named it Chingi-tura in honor of his benefactor. Another source makes On a Nogai whose 'Hoflager' (German for 'court-camp') was Kasyl-Tura at the mouth of the Ishim River about 100 miles east of Tobolsk. Another source says that when Tokhtamysh was defeated he fled to the 'land of Sibir' (the first mention of 'Sibir' in Russian chronicles). Here he was protected by On until both were killed by Edigu about 1405. There is no more information about Taibuga except that some say he drove the Novgoroders from his lands. In 1428 a 17-year old Shaybanid called Abu'l-Khayr Khan was chosen Khan on the Tura River (at Tyumen?). This implies that the Taibugids had been pushed aside. When he led his followers south for better things the remaining Shaybanids gathered around Ibak Khan, who was from a junior branch of the house. The Taibugids must have been restored because some time between 1464 and 1480 Ibak killed the Taibugid Mar and made himself Khan. In 1483 Fyodor Kurbsky is said to have led an army to the Irtysh River, but this had no lasting effects. Ibak went to the Volga where he killed the last Khan of the Golden Horde. Returning, he was killed by Mar's grandson called Mamuk or Makhmet or Mamet (about 1495). Makhmet moved the capital from Tyumen to Sibir and was briefly Khan of Kazan (1496). In 1552 the Taibugids Yediger and Bekbulat congratulated Ivan the Terrible on his conquest of Kazan. Later they paid limited tribute to Russia. In 1563 Ibak Khan's grandson Kuchum seized the throne from Yediger and Bekbulat. In 1573, following the Russo-Crimean War (1571) he stopped paying tribute and raided the Perm lands. In 1582 he was driven out by Yermak and died some time after 1600. Seid Akhmat (reoccupied Sibir after Ermak's death, captured by Russians in 1588). ^ John Smith, A System of Modern Geography: Or, the Natural and Political History of the Present State of the World vol.1 p.321. ^ Nicholas Riasanovsky (1999). A History of Russia. Oxford University Press. p. 148. ISBN 0-19512179-1. ^ Миллер Г. Ф. Глава первая. События древнейших времён до русского владычества // История Сибири — М.-Л. : АН СССР, 1937. — Т. 1. — С. 189-194. Tobolsk is a town in Tyumen Oblast, Russia, located at the confluence of the Tobol and Irtysh Rivers. Founded in 1590, Tobolsk is the second oldest Russian settlement east of the Ural Mountains in Asian Russia, and is a historic capital of the Siberia region. Population: 99,694 (2010 Census); 92,880 (2002 Census); 94,143 (1989 Census). Jochi was a Mongolian army commander who was the eldest son of Genghis Khan, and presumably one of the four sons by his principal wife Börte, though issues concerning his paternity followed him throughout his life. An accomplished military leader, he participated in his father's conquest of Central Asia, along with his brothers and uncles. Yermak Timofeyevich was a Cossack ataman and is today a hero in Russian folklore and myths. In the reign of Tsar Ivan the Terrible Yermak started the Russian conquest of Siberia. The Khanate of Astrakhan was a Tatar Turkic state that arose during the break-up of the Golden Horde. The Khanate existed in the 15th and 16th centuries in the area adjacent to the mouth of the Volga river, around the modern city of Astrakhan. Its khans claimed patrilineal descent from Toqa Temür, the thirteenth son of Jochi and grandson of Genghis Khan. Siberian Tatars, the indigenous Tatar population of the forests and steppes of South Siberia, originate in areas stretching from somewhat east of the Ural Mountains to the Yenisei River in Russia. The Siberian Tatars call themselves Yerle Qalyq, to distinguish themselves from more recent Volga Tatar immigrants to the region. Qashliq, Isker or Sibir was a medieval Siberian Tatar fortress, in the 16th century the capital of the Khanate of Sibir, located on the right bank of the Irtysh River at its confluence with the Sibirka rivulet, some 17 km from the modern city of Tobolsk. The fortress is first mentioned in Russian sources of the 14th century. The Uzbek Khanate of the Abulkhairids was the Shaybanid state preceding the Shaybanid Empire of Muhammad Shaybani and the Khanate of Bukhara. During the few years it existed it was the preeminent state in Central Asia. This is the first state of the Abulkhairids, a branch of the Shaybanids. Chimgi-Tura or Chingi-Tura was a medieval city of the Siberian Tatars in 12th-16th centuries located in Western Siberia. The Shaybanids were a Persianized dynasty of Mongol origin in Central Asia. They were the patrilineal descendants of Shiban, the fifth son of Jochi and grandson of Genghis Khan. Until the mid-14th century, they acknowledged the authority of the descendants of Shiban's brothers Batu Khan and Orda Khan, such as Öz Beg Khan. The Shaybanids originally led the grey horde southeast of the Urals, also known as the Uzbegs (Uzbeks), was converted to Islam in 1282. At its height, the khanate included parts of modern-day Afghanistan and parts of central Asia. Descent from Genghis Khan, generally called Genghisids, is traceable primarily in Mongolia, India, China, Russia, Southeast Asia and the Middle East. His four sons and other immediate descendants are famous by names and by deeds. Later Asian potentates attempted to claim descent from the Borjigin even on flimsy grounds, such as was considered Mongol matrilineal descent. In the 14th century, valid sources all but dried up. With the recent popularity of genealogical DNA testing, a larger and broader circle of people started to claim descent from Genghis Khan. Abu'l-Khayr Khan (1412–1468) was a leader of the Uzbek Khanate which united the nomadic Central Asian tribes where the Kazakh Khanate later separated in rebellion under Janibek Khan and Kerei Khan beginning in 1465. The Battle of Chuvash Cape led to the victory of a Russian expedition under Yermak Timofeyevich and the fall of Khanate of Sibir and the end of Khan Kuchum's power. The battle took place near Qashliq (Isker). The Russian conquest of Siberia took place in the 16th and 17th centuries, when the Khanate of Sibir had become a loose political structure of vassalages that were being undermined by the activities of Russian explorers. Although outnumbered, the Russians pressured the various family-based tribes into changing their loyalties and establishing distant forts from which they conducted raids. To counter this, Kuchum Khan attempted to centralize his rule by imposing Islam on his subjects and reforming his tax-collecting apparatus. Western Siberia or West Siberia is a part of the greater Siberia and mostly located in the Russian Federation. It lays between the region of Ural and the Yenisei River which conditionally divides Siberia into two halves. The Khanate of Sibir was a Muslim state located just east of the middle Ural Mountains. Its conquest by Yermak Timofeyevich in 1582 was the first event in the Russian conquest of Siberia.